On a Saturday night at 9pm, I was working on my Algebra II Honors lesson for Monday. Isn’t that how everyone spends their Saturday night? Anyhow, I had some great Linear Programming problems written by Brad Latimer from Science Leadership Academy and shared with me by Diana Laufenberg at an ISTE training this summer. I was working through the first one which takes students through the Linear Programming process of defining variables, writing constraints, writing your target equation, etc. 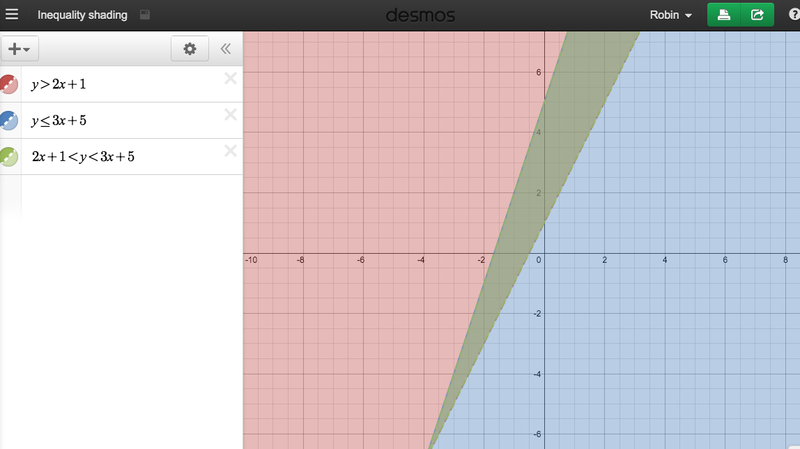 When I got to the graphing part, I pulled up Desmos and to my horror, it was REALLY hard to see the feasible region with 6 different colors overlapping. So after doing a Google search and coming up empty, this is what I tweeted, tagging Desmos in case someone might be able to respond from their company, and tagging #mtbos. And, for reals, I got the following responses, within 3 hours on a Saturday night, from Matt Vaudrey and Christopher Danielson. And this just made me laugh. 🙂 I’ll link the problem I got from Brad at the end of this post, you all can decide if I’m mad or not. Both guys gave of their Saturday evenings to help me, someone they don’t really know, accomplish something for my students. Grateful doesn’t begin to describe how I felt. I was just stumped and don’t know if I would have ever come up with the ideas they gave. 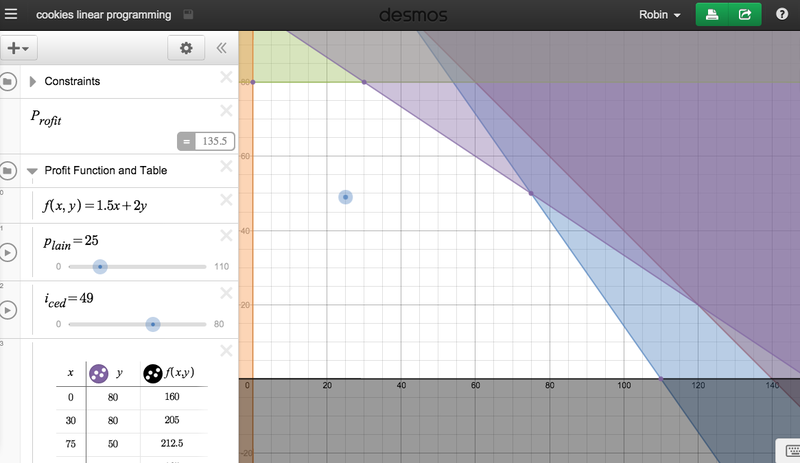 And then, the response from Desmos, less than 12 hours after my plea for help, was far more than I could have expected. Which links to this bad boy (check out the link because I can’t screen shot it’s goodness in entirety). I can’t wait to share all of this with my students! Not only am I sharing the Desmos techniques, but also the Twitter thread. We are doing something called (i)Project this year in which all students will have about a 6 month long passion project. Part of this will include teaching them how to connect with Professionals on Twitter. I ‘m excited to share with them how supportive the Twitter world really is. 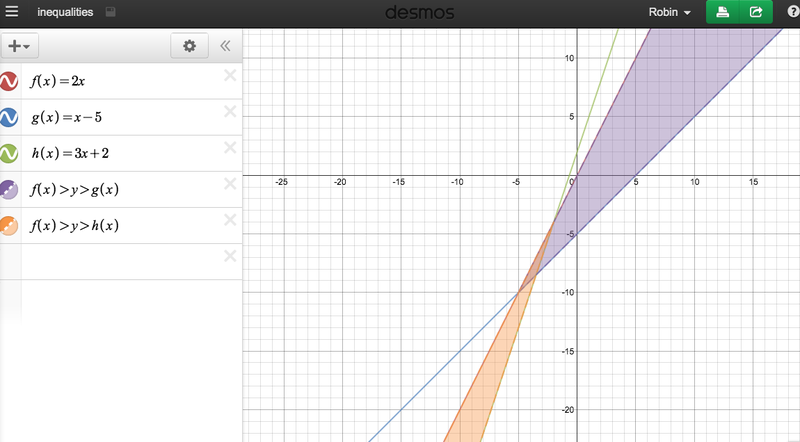 This entry was posted in Teaching and tagged desmos, graphing, linear programming on September 14, 2014 by romathio. This entry was posted in Research and tagged Daniel Willingham, Hattie, Hattie Effect Sizes on September 13, 2014 by romathio.